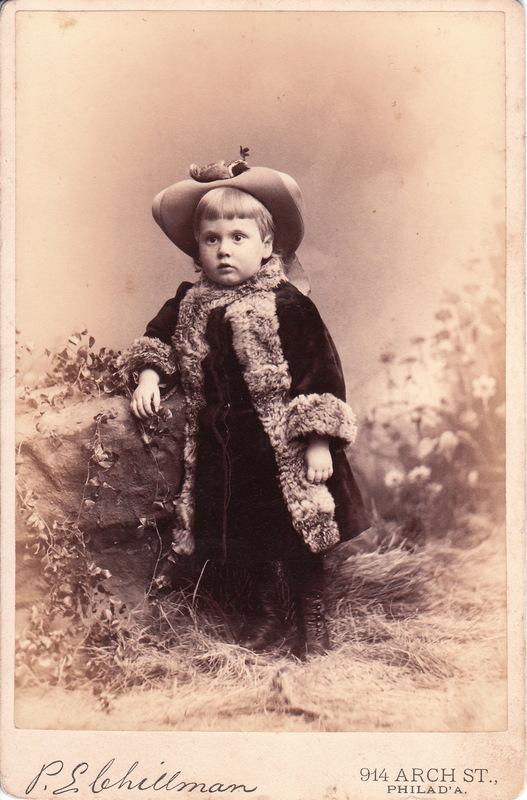 This cabinet card introduces us to an adorable little girl. She is well dressed and wearing lots of jewelry. Her jewelry includes a brooch shaped like a bird that is carrying a letter in it’s beak (see photo below). She is also wearing earrings, bracelets, and a pendant on a chain. The studio photo was taken by the MacIntire studio in Philadelphia, Pennsylvania. James A. MacIntire is listed in the 1903 and 1904 business directory as a photographer. 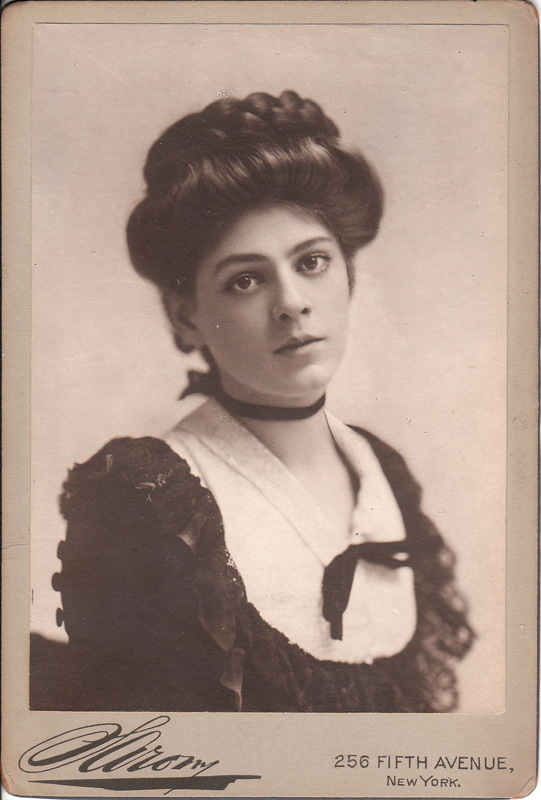 Ethel Barrymore (1879-1959) was an outstanding American actress and a member of the famous theatrical Barrymore family. She was born Ethel Mae Blythe in Philadelphia, Pennsylvania. Her parents were actors and she was the sister of John and Lionel Barrymore. She was the great aunt of modern day actress Drew Barrymore. Ethel Barrymore was considered by many to be the greatest actress of her generation. She was a major Broadway performer and first appeared there in 1895. She had roles in A Dolls House by Ibsen (1905). She was a strong supporter of the Actors’ Equity Association and played a major role in the 1919 strike. She played in Somerset Maugham’s comedy, The Constant Wife (1926). She also starred in motion pictures beginning her film career in 1914. Notable films included None but the Lonely Heart (1944) and The Spiral Staircase (1946). Around 1900, Winston Churchill proposed marriage to Barrymore but she refused. She later married Russell Griswold Colt in 1909 and had three children. She died of cardiovascular disease in 1959 at her home in California. The Ethel Barrymore Theatre in New York City is named in her honor. The top cabinet card portrait of Ethel Barrymore was photographed by Phillips Photographers of Philadelphia, Pennsylvania. To view other photographs by Phillips, click on the category “Photographer: Phillips”. The second cabinet card image of the actress was produced by Sarony, the famous celebrity photographer who’s studio was located in New York City. To see other Sarony photographs, click on the category “Photographer: Sarony”. The third portrait of Miss Barrymore appears on a postcard published by the Rotograph Company who operated in New York City and Germany. This postcard portrait was taken by famed Chicago photographer William Morrison. He is well known for his excellent portraits of theatrical stars. He produced both real photo postcards and cabinet cards. This postcard is number HB/1422 of the “Rotograph Series”. The image on this postcard is color tinted. This postcard has been mailed and postmarked (1907). The reverse of this postcard can be seen below.To view other photographs by Morrison, click on the category “Photographer: Morrison”. The fourth portrait of Ethel Barrymore is an uncommon one. The image provides a lovely profile view of this legendary actress. If you search for this exact postcard online, you likely won’t find it. This postcard was published by E. Frey & Company who operated in New York City . Research reveals that postcards displaying the printed name of “E. Frey” were actually published by the Souvenir Post Card Company which existed between 1905 and 1914. It was located at 268 Canal Street in New York City. The company was purchased by Valentine & Sons and the combined company became Valentine – Souvenir. This postcard was printed in Germany and is in good condition (see scan). The fifth photograph of Miss Barrymore was published by the Rotograph Company. This postcard portrait was taken by famed Chicago celebrity photographer William Morrison.This postcard is number B 662 of the “Rotograph Series”. The image has excellent clarity. 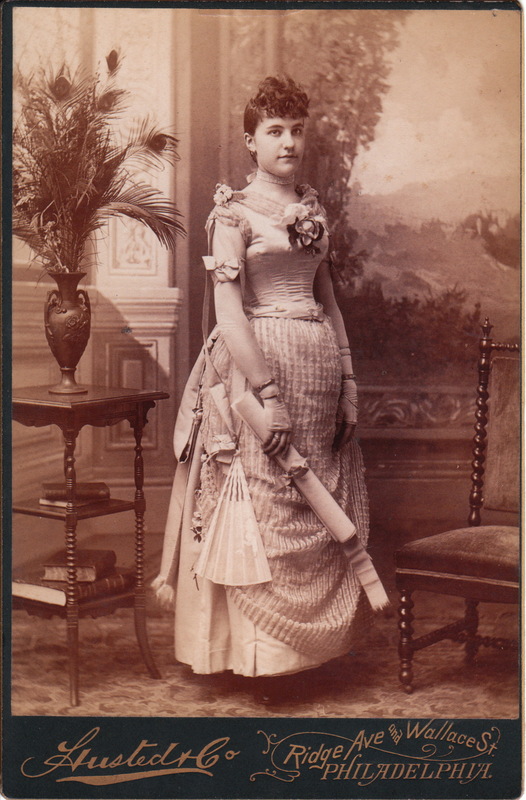 The pretty woman in this cabinet card photograph certainly knew how to dress fashionably. To accentuate her beauty her hair is carefully styled and she is wearing jewelry. She has a solemn expression as she intensely stares at the photographer. The photographer of this wonderful portrait was A. Newman of Philadelphia, Pennsylvania. To learn more about him and to view more of his photographs, click on the category “Photographer: Newman”. 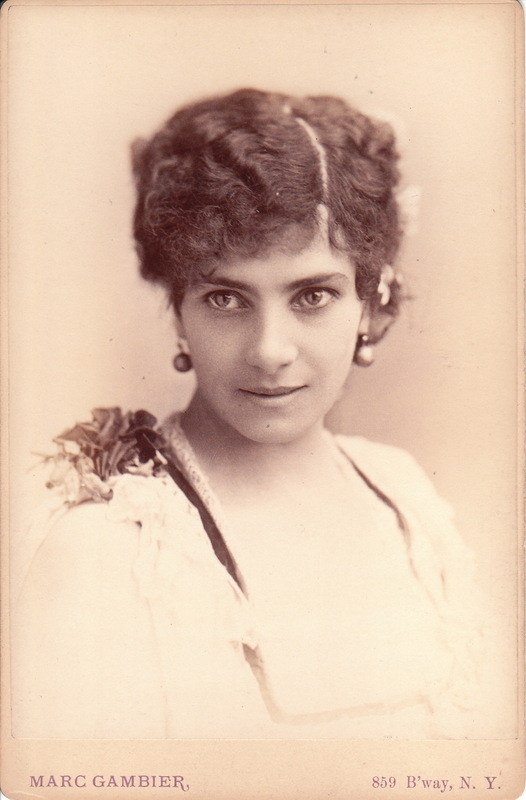 The top cabinet card features early theatre actress, Jennie Winston. Unfortunately, biographical information concerning Ms. Winston appears to be sparse, and further research is necessary. 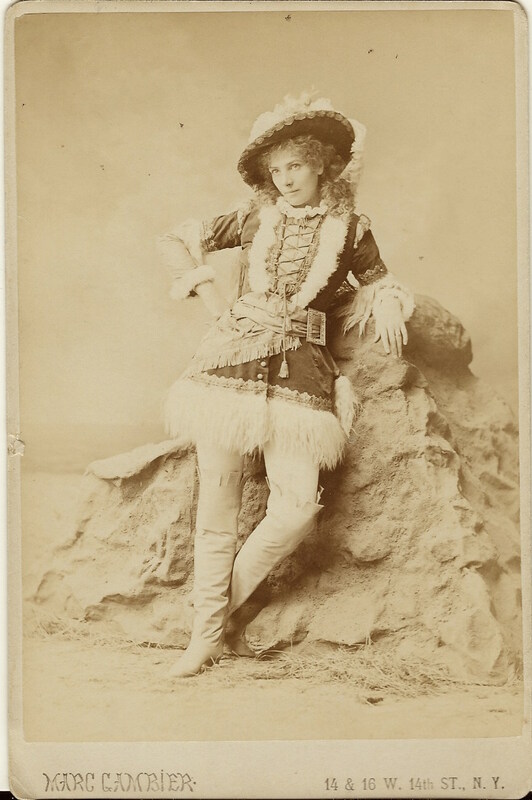 An 1881 publication reveals that Jennie Winston was a native of Scotland and moved to Australia to join W. S. Lyster’s Italian Opera company. Her tenure with this company was seven years. She next went ot America under engagement to “Mr Maguire”, for whom she worked for one season’s duration. She then formed her own traveling opera company which journeyed to the western United States and British Columbia. The “Dramatic News” described Winston as “unsurpassed as a comic-opera artist by anyone in this country”. The photographer of this portrait was the studio belonging to Gilbert & Bacon. This studio was well known for their quality work as well as their work with local and visiting celebrities. To view other photographs by this studio, click on the category of “Photographer: Gilbert & Bacon”. 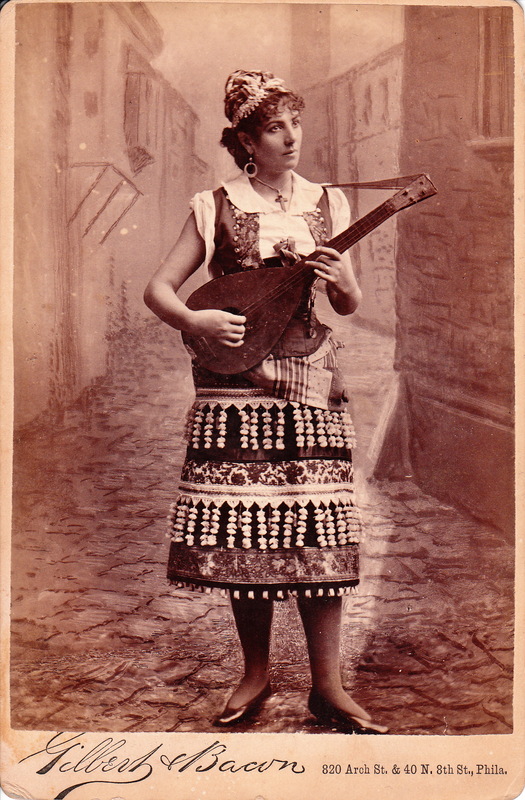 The second photograph, also by Gilbert & Bacon, captures a costumed Jennie Winston playing the mandolin. Note the backdrop used in this photograph. The backdrop was an excellent choice for the photograph as it is compatible with Ms. Winston’s costume. It was also a good choice technically; the actress does realistically appear to be standing on a winding stone road. The third photographic portrait features a sultry looking Jennie Winston, and is by celebrated photographer, Marc Gambier (1838-1900). 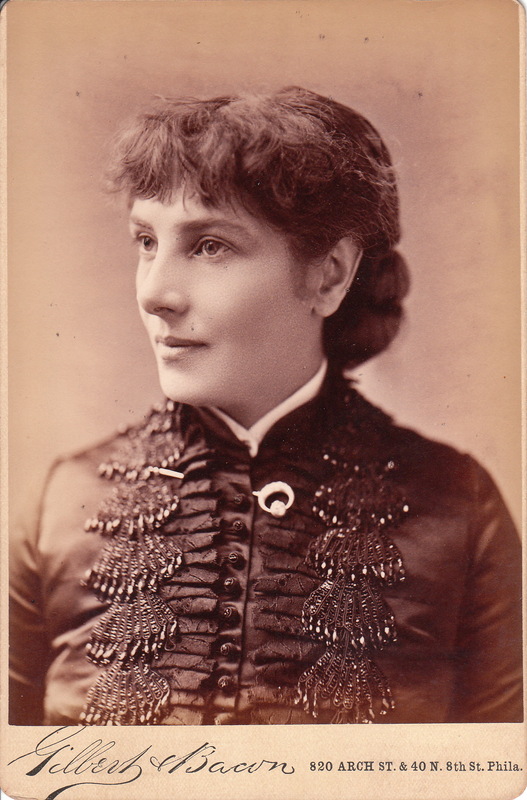 The fourth cabinet card portrait was also photographed by Gambier. Miss Winston is in costume for an unnamed theatrical performance. She is acting in the portrait. Note her provocative and coy appearance. Gambier was born and educated in Paris, France. At the age of 19, he came to America for a very short stint of time. He returned to France and became a student of the great painter, Le Creton. Subsequently, he became a student of another great painter, Camino. He then returned to America and for five years, studied and worked under esteemed photographer, Sarony (view Sarony’s photographs by clicking on the category “Photographer: Sarony”). He then launched his own photography business in New York City. He divided his time between his first love, painting, and his business of taking and selling photographs. Gambier was known as a great historical painter. He was a veteran of the French Army and while in the service, he sketched and painted several important battles. Research reveals that Gambier was listed in the 1880 US census. He was forty-one years old and living in New York City with his family. He is listed as living with his wife Emilie (age 28), daughters Louise (age 10) and Emilie (age 7), and son M. L. (age 2). Also in the residence was a young woman (age 25) who worked as a servant. 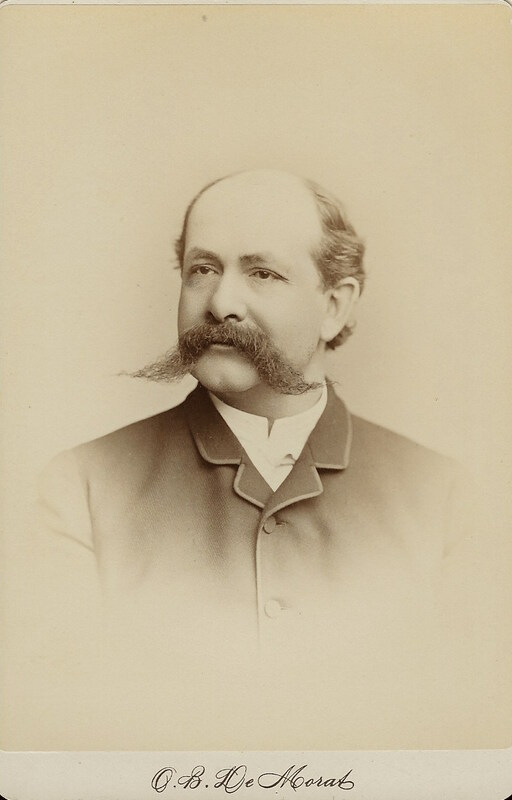 Gambier was known for the many theatrical photographs he produced as well as for selling postage stamp sized portrait photographs, that people attached to their letters and postcards. Meet Pauline Huber Ely. You are looking at what appears to be her graduation picture. She is wearing a fancy dress and holding a rolled scroll that is likely a diploma. She also has a hand fan at her side.The photographer is Husted & Company which was located in Philadelphia, Pennsylvania. Draper and Husted were partners in a studio during the 1860’s and 1870’s. Joseph Husted was featured in a brief article in the American Journal of Photography (1887) which praised his child portrait work. 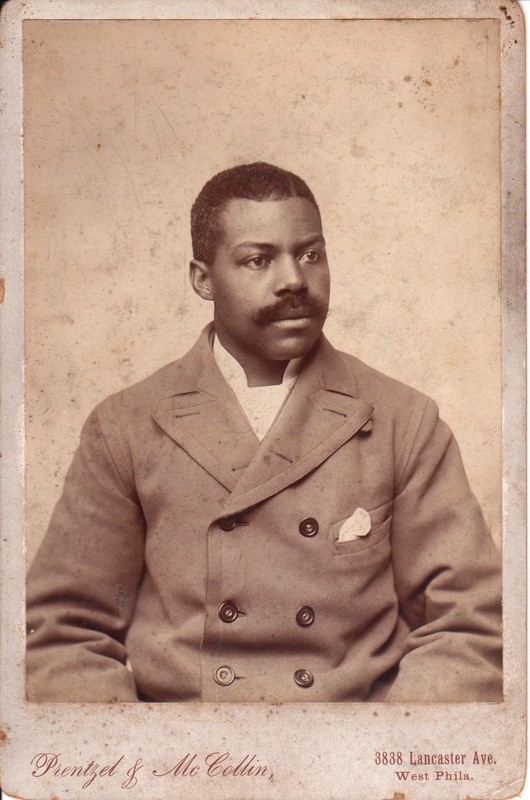 This cabinet card features an African American man posing for his portrait at the Prentzel & McCollin studio in West Philadelphia, Pennsylvania. He is likely dressed in his Sunday’s best for this photograph. Cabinet card portraits of African Americans are not commonplace. To view a collection of such images, click on cabinet card gallery’s category “African Americans”. One source identifies the photographers as Frank Prentzel and Carl J. McCollin. No confirmation could be located. In fact, research found several sources mentioning a cabinet card era photographer in Philadelphia named Thomas McCollin.